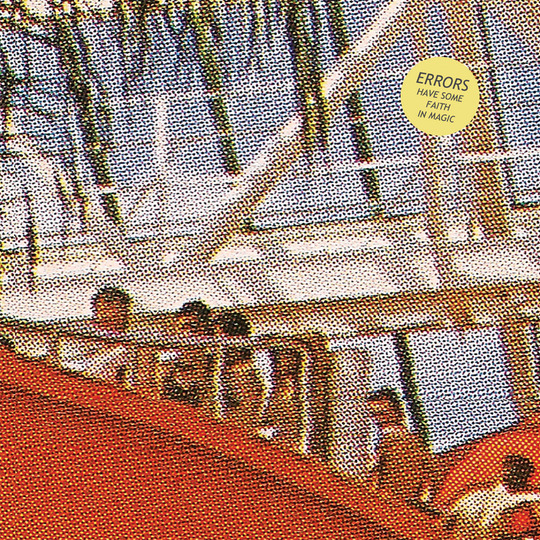 Emblazoned across the cover of Errors’ Have Some Faith In Magic are several hallucinated figures, obscured by a VHS-grain fuzz that slurs their surroundings into a strange tangle of architecture. Expressions are unrecognisable and surfaces unintelligible, creating the perfectly mesmeric cover for a band whose concerns about identity fall far behind the scope of their sound. It’s a strange blend of artifice and reality that reflects their sound perfectly – emotive electronic music that’s as artificial as it is heartfelt. Errors’ career started with the glitchy, analogue It’s Not Something But It is Like Whatever in 2008, followed by the floatier, more spaced-out Come Down With Me in 2010. Whilst enjoyable enough on their own, these albums felt a little restricted by their hardware – staccato and rigid instrumentation holding back the far more expansive vision under the surface. Songs like ‘A Rumour in Africa’ from the latter were enjoyable enough on their own, but perhaps missing the spark of ambition and scope that would come to fruition on 2012’s Have Some Faith In Magic. I was fourteen years old when I first heard the shimmering intro to ‘Tusk’, the album’s opener – and some ethereal quality of its being pulled me into the world of Have Some Faith In Magic, completely enchanted and enraptured by the landscape painted before me. A flutter of synthesisers set the tone for something bright and sparkling, before a crunching, distorted riff sears through the track like a god ray. The song swells into a titanic, life-affirming ballad before receding backwards, folding in on itself and morphing effortlessly between states. Errors’ songwriting is at its peak on tracks like these – with wonderful dynamic shifts and tonal changes mid-track that give every song its own multi-faceted character. ‘Magna Encarta’ swiftly follows, with trembling leads and mesmeric walls of noise to boot. Here are the first signs of something truly unique about Errors – their lyrics, or rather, lack of. The vocals on ‘Magna Encarta’ and indeed many other Errors tracks are doubled, tripled, quadrupled – reverberating endlessly and slurred into expressionistic swathes of non-speech. The group don’t sing in the straightforward sense – the words totally unintelligible and more serving as another texture within their sonic palate, camouflaged against the whorl of instrumentation behind it in similar fashion to the blurred figures that adorn the cover. 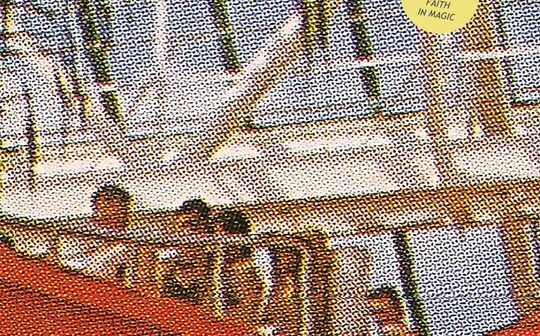 Perhaps the album’s highlight and crowning jewel of Errors’ career is the glittering, expansive and triumphant ‘Pleasure Palaces’. The song sounds the control room of some titanic starship – where tangles of the biological and synthetic clash and meld together into pillars of twitching, wavering electronics. The song builds up and up on itself, entering blissful, stratospheric heights before slinking into a hazy dance-groove and eventually juddering to its crumbling finish. It’s the album’s highest point, the techno-angelic choral vocals soothing, yet ominous – perhaps a coded warning; a distrust of the digital spaces people call home, or a prayer to a new age of technocracy. After Have Some Faith in Magic, Errors took a few steps back from the harsher textures present on the album (especially towards the close, on tracks like ‘Holus-Bolus’ and ‘Barton Spring’), recording New Relics and Lease of Life with an even sharper focus on the blurred lines between artifice and reality. Songs like ‘Pegasus’ and ‘Genuflection’ respectively show this evolution in sound, improvements on what made their own brand of swirling post-disco so listenable in the first place, perhaps even making them better albums as a result; but nothing replaces the decadent, experimental and criminally underrated work of art that is Have Some Faith In Magic – an album that deserves far more recognition than it has garnered since its release in 2012 – a testament to vision and creative control in equal parts. Have Some Faith In Magic is available now via Rock Action Records.